Greetings Birdie Bashers from a sunny Tenerife. Far be it for me to gloat although I’m sure you will have managed to knock the odd wee white pill about the verdant links since I went away. Let’s hope so as the weather prior to departure was horrendous. So in considering this weeks wittering I thought it would be good to look ahead to our up coming annual rabble rousing wool pulling and excuse strewn meeting we like to call the AGM. Probably the most entertaining official gathering of our year. Looking back I have been at 30 of these over the years and never fail to smile. And so we stumble to the close via the election of the condemned (captain and his committee) the acceptance of accounts and the thanking of the masses for attendance if by luck more that 10% of the membership have bothered to turn up and vote then Brenda smiles and we have a pint. So pitch up at the AGM ... It’s your club run by good people if you can’t be bothered why should they? After a poor run of weather, the course opened on winter greens for the weekend. 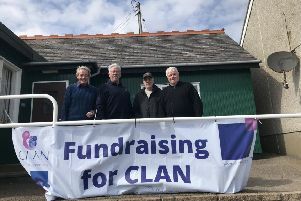 It was a delight to see a good sized turnout after some quiet clubhouse days and it suggested many members were eager just to get away from the house! It’s a busy week in the clubhouse. First up is club EGM/AGM on Thursday evening. Tee time booking on Thursday will be available from 6.15pm on AGM night only. We are staging a Burns Night this upcoming Saturday. Tickets still available at £20 – get yours now. Following club AGM, renewal subscriptions will begin to be issued the following week. If members have not received recent e-mails from the club please check junk/spam folders and advise club of your current e-mail address.